A yellow weather warning for rain has been issued for Lancashire with thunder and lightning storms expected to batter the region, say weather experts. 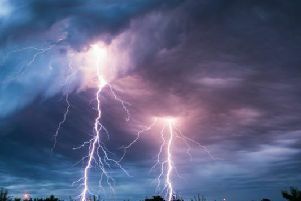 Forecasters at the Met Office are warning members of the public to take care on Friday, June 1 when the huge thunderstorms are expected to hit. As much as 60mm of torrential rain could fall in just a few hours and roads, homes and businesses could be at risk of flooding, experts say. Large hail and frequent lightning are also possible which may cause problems for public transport and energy supplies. A spokesman for the Met Office said: "An area of thunderstorms across southern England and Wales is expected to move northwestwards towards Northern Ireland during Friday morning. "This is then replaced by scattered thunderstorms across southern, central and northwest England, plus Wales and Northern Ireland by the afternoon and persisting into the early evening. "These are likely to bring torrential rain to some places with the potential for 20-30 mm of rain to fall in an hour and perhaps as much as 60 mm in a few hours. "Frequent lightning and large hail are also possible." The weather warning is in place until 9pm on Friday night.